The King James or 'Authorized' Version was commissioned in 1603 when James became King of England. It was first published in 1611 and attained a unique authority, gradually superseding all previous versions. The first Cambridge printing was in 1629, establishing a tradition of care for the accuracy of the text that has been maintained to this day. 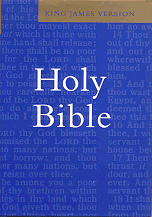 The "KJV" is a classic of the English language and is still a very widely accepted translation.